The hamlet Solomár (later Solymár, German: Schaumar) was first mentioned in an official record in 1266. The village’s name is of Hungarian origin and means “falconer” and thus points to the residence of the royal falconers. The village flourished in the following centuries and a royal hunting seat was built in its surroundings which burnt down in 1561. Later, a fort was built on the same ground which was destroyed during the Ottoman invasion. The first new settlers came to Solymár from Serbia in the 18th century. Next were German settlers from the 1720s onwards, who came from the Black Forest and the area around Fulda. In 1747, Solymár hat 550 inhabitants. In the 19th century, the village was subject to a dynamic development. It produced wine, fruit, wheat and cabbage which could be sold in the capital. In 1910, 3.108 people resided in Solymár, 1.086 Hungarians, 1.983 Germans and 25 Slovaks. Most inhabitants were of Roman Catholic faith. After World War II, 1.960 persons were displaced to Germany on April 18th 1946. 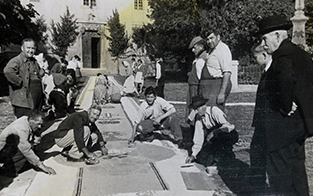 The local history collection was established in 1972 and commemorates the life, customs, traditions and festivities of the ethnic German population. One exhibition room shows a corner shop from the early 20th century. 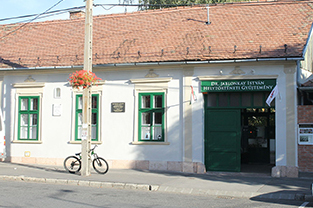 Other one shows an old Solymár apothecary in the style of the secession. In proximity of Templom tér (church square) other sights are reminiscent of the former German speaking community: A memorial stone created for the 300th anniversary of German settlement in Solymár was erected in 2001 by the initiative “German National Self-Government”. Furthermore, a memorial service is held by the stone each year on the third Sunday in June. The day is also celebrated as “day of Solymár folklore costums” and is supposed to strengthen the identity of the ethnic German population still living in the city. The memorial for the displaced can be found on the outer wall behind the church. It was created by Jenő Kovács and consecrated in 1996. 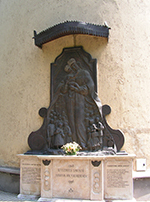 Under the relief, two plates display a prayer to Mary Mother of God – in German and Hungarian language. “Tradition” is the name of a bronze sculpture created in 2006 by Jenő Kovács. 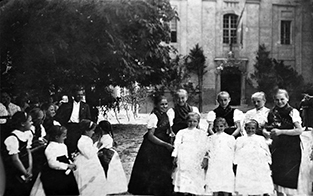 It shows a married couple of German origin in traditional Solymár costume on their way to church. The statue of “Grieving Christ” is a late baroque stone statue erected in 1838 on behalf of the many families by the name of Milbich living in the village. The statue originally stood near the chapel of Saint Anne, but was refurbished, had a small roof added and was relocated to its present day position in 2000. Preparation of a flower arrangement for the Feast of Corpus Christi, around 1940. 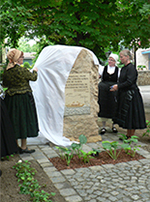 LEFT: Memorial stone commemorating the 300th anniversary of German settlement in Solymár. RIGHT: Memorial for the displaced, consecrated in 1996. Solymár folklore costume, around 1935.